New "Game of Thrones: Oathbreaker" board game coming Spring 2019 – AiPT! A social deduction game of backstabbing and betrayal. This Spring HBO and Dire Wolf Digital are bringing to life Game of Thrones in the board game format. 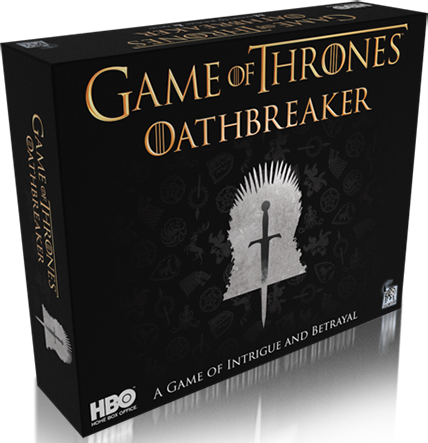 Called Oathbreaker, the social deduction game is a game of deception for 5 to 8 players. Similar to Clue, but maybe even better, the game is about players enacting secret agendas and players determining who is a real ally or enemy. The game will cost $35 and each game should take 30 to 45 minutes. Not bad if you want to pretend to be a princess or lord, eh? Check out the press release for the full details below. Denver, CO – MARCH 12, 2019 – Dire Wolf Digital and HBO® are proud to announce Game of Thrones: Oathbreaker, a social deduction game of ambition and deceit coming to your tabletop just in time for the final season of the hit HBO® original series! Dire Wolf Digital is an independent game studio specializing in both digital and physical strategy card games and board games. Based in Denver, Colorado, the Dire Wolf Digital team includes more than 100 passionate designers, artists and engineers creating games for some of the world’s top brands, as well as original properties, including digital strategy card game Eternal, the hit board game Clank! : A Deck-Building Adventure, The Pokémon Trading Card Game Online, and an exciting lineup of upcoming digital and physical titles. HBO Licensing & Retail, a division of Home Box Office, Inc., partners with best-in-class licensees around the world to give HBO’s global audience new and exciting ways to engage with their favorite shows. The division leverages iconic, award-winning HBO programs such as Game of Thrones, VEEP, Sexand the City, Silicon Valley, Insecure, The Sopranos, Big Little Lies, True Blood and more to create officially licensed consumer products, innovative merchandise programs, retail activations and live immersive experiences. HBO Licensing & Retail works across a broad range of product categories, including collectibles, apparel, publishing, live branded experiences, digital gaming, fashion and beauty collaborations, luxury accessories, and beyond. Officially licensed HBO merchandise can be purchased in retail stores around the world, online in the US at http://store.hbo.com, and at the HBO retail hub, the HBO Shop®, located at 42nd and 6th Avenue in New York City.